Japan’s national 野球 (baseball) team is called 「侍JAPAN」 (“Samurai Japan“). The World Baseball Classic (WBC) series began in 2006. There have been only two WBC series so far…the one in 2006, and the second one went from March 5, 2009 and ended today. (Click here to read my earlier post about the World Baseball Classic (WBC)). The champions of the WBC 2006 series was 「侍JAPAN」 (“Samurai Japan“)…and Japan defended their title today. "Ichiro" Suzuki of the 「侍JAPAN」 ("Samurai Japan") team. Japan, Korea, USA and Venezuela. On March 21, Korea played Venezuela and won with a score of 10-2…eliminating Venezuela. On March 22, Japan played the USA and won with a score of 9-4…eliminating America (USA). The final game of the WBC 2009 today was Japan vs Korea…and Japan won with a final score of 5-3. At the end of the ninth inning, Korea scored a point which brought the score up to 3-3…so the game went into “extra innings”. In the tenth inning, Japan got two more points to win the series! 「侍JAPAN」 (“Samurai Japan“) are the world baseball champion team. tokyo, you should write about much important thing called ” earthquake”. Anyways, why wouldn’t I write about Japan’s baseball team becoming the world champions? Was it a pretty big deal in Japan? I’m not a big baseball fan, but was aware of it and watched snippets of it. Real baseball fans here followed it pretty closely. Was glad Japan won if the US didn’t. This is supposed to be a “World Cup” for baseball. From what I’m seeing in the media here, the fact that the Japan-Korea final was such a great game has helped establish the WBC as a permanent event. Yes, it was pretty popular here. I think it was popular in every country…except maybe America. Yes, I was a replay of the game last night on TV in Tokyo (I don’t remember the channel on CATV). It was an exciting and well played game – both teams were well matched. I don’t have cable. I watched it live on regular (Japanese) TV. Yes, it was quite a surprise went it became tied in the 9th innings and went into “extra innings”! tokyo5, Japan deserved to win. Korea played well in the tournament as did Venezuela. The U.S? They were lucky to even get into the final four. So you watched the WBC series? I heard that most people in America weren’t even aware of the series. it was indeed an epic win. Darvish, Ichiro, Lee, Kim, all impressive ball players that I would love to see in American baseball. Darvish will probably pitch in Japan well into his twilight. Perhaps Lee or Kim will come here. >Darvish, Ichiro, Lee, Kim, all impressive ball players that I would love to see in American baseball. Ichiro already plays in America’s MLB, doesn’t he? I bet Yu Darvish could move to the MLB league too! Hubby glanced at the game when it was 3-3. Too bad my fave countries lost — USA and Korea. >Hubby glanced at the game when it was 3-3. >Too bad my fave countries lost — USA and Korea. Both are Japan’s biggest rivals in baseball. The Korean team is quite good too. 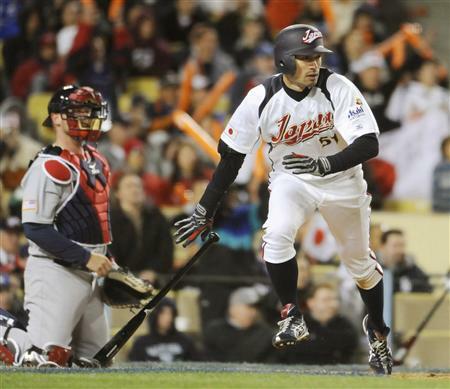 Japan played Korea five times in the WBC ’09! Korea beat Japan in two of those games. My youngest brother is an avid baseball fan, well I grew up surrounded by softball players, started from my elder brother, he mentioned to me about Japan’s game against Korea today and I totally missed it! Been a long time since ive watched a baseball game on the telly. Im more of a football (soccer) fan nowadays. I wonder if ESPN will show it again… congratulations to Samurai Japan’s winning! At least the highlights, I’m sure.